I never liked liver when I was little. Where we lived, the whole animal was used in food prep, nothing wasted. Nevertheless I attempt to make it palatable for my kids, it's so healthy! So this is yet another try which my husband and I absolutely loved and my kids wanted nothing to do with. Okay, so at least Baby T gets some of the vitamins and minerals through breast milk. Baby E though - who really needs it for remineralizing teeth, can't even smell it! It was worth a try though. This is relatively easy to make, especially because you save time by not taking the film off the liver the way you would need to if you were just sauteing it. You will need a food processor, high powered blender, or meat grinder. I borrow my moms Ninja because yes, my friends, my real foods kitchen does not have a food processor, yet [gasp!]. It worked okay, but I had to stop it several times to scrape the sides and mix the contents because the top wasn't getting ground up. Though an easy recipe, it is a little time consuming, so plan for a solid hour to make it, it is best made a day ahead and eaten cold out of the fridge. There are many ways to eat the pate: as is, as a 'meat' for dinner with a side and salad, on top of toast, with some homemade crackers, in your lunch sandwich, whatever you can imagine. 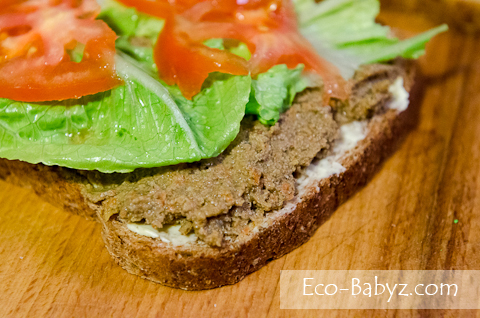 We love it on some sprouted bread. 1. Optionally, soak liver overnight in milk to make the taste more palatable. 2. Cut liver into 1-2 inch pieces and fry in pan on medium-high until it's brown on all sides and no longer bright pink on the inside. Make sure to cook it through so you don't end up with raw liver pate and the potential for it to spoil quick. 3. Slice onions, garlic, grate carrots and slice mushrooms, saute in one skillet adding them in that order until soft in texture. 4. Place the liver, sauteed vegetables, softened butter, salt, and pepper in blender and blend until it all incorporates into the pate. Scrape sides if necessary. 5. Let it cool if it's still warm, place in container and refrigerate. 6. 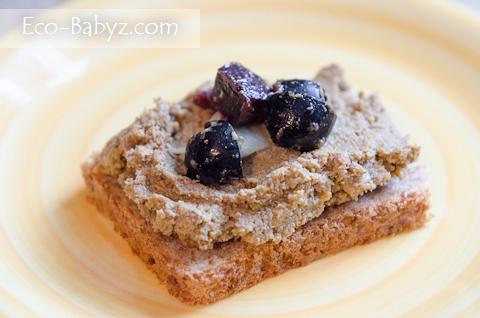 Enjoy with dinner, on toast or crackers, in a sandwich, or by the spoonful! This sounds interesting. I haven't tried liver before.